I can't seem to find the holiday cheer this year. Perhaps it's this crazy weather - spring-like last week (I passed the farm down the road to see freshly plowed fields with straight lines of tiny green plants, in December! In Colorado?!) and now we're in the heart of a blizzard. Or maybe it's the fact that Thanksgiving seemed to sneak up so suddenly, and Christmas is too soon to follow. Whatever the reason, I still can't believe that it's already time to decorate the house for Christmas! But, though the cheer was absent, tradition in our house dictates that the Christmas tree arrives the weekend after Thanksgiving. So, last weekend I put on some classic music, started shuffling furniture around and hauled in the big Christmas tree. 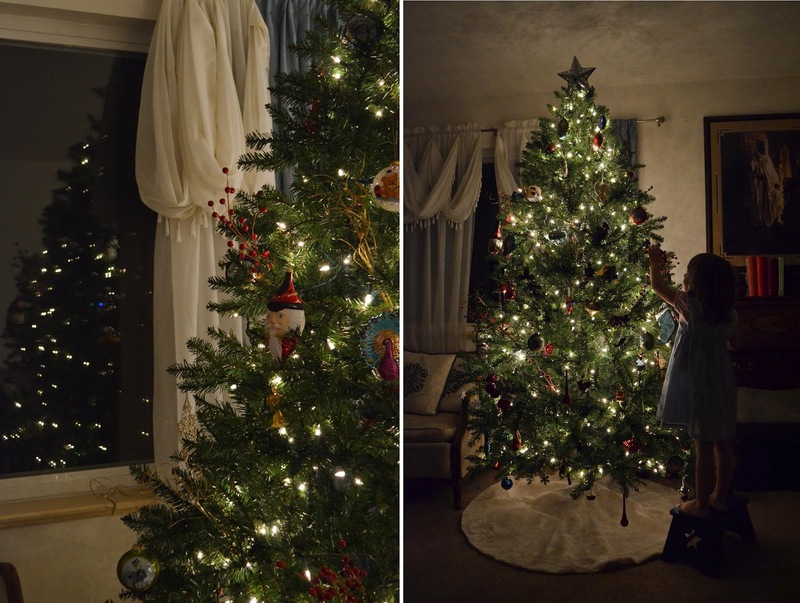 In childish wonder, the kids gleefully danced to the music that filled the living room, while I fought with the tree and waded through a sea of tangled lights. Frank Sinatra, Nat King Cole, Dean Martin, and Ella Fitzgerald all made an appearance that afternoon, bringing with them the bits and pieces of holiday cheer that were missing. There's a reason why these songs are my favourites. They are the songs from my childhood. Those old, scratchy LPs with the beautifully coloured covers, that would coax my brother and I into a dancing frenzy so many years ago. Bouncing and jumping in spirited joy until the old record skipped and my mother would scold us and demand we calm down. Oh to have that kind of naïve joy once again! If there's one thing I'm certain, I will never rob my children of the joy that classic Christmas carols bring. So I turned up the music and let them dance to their heart's content. No risk of skipping the records on Pandora, though I love that many of the old recordings still have that grainy quality to them. With the tree standing tall and lit with hundreds of twinkling lights, I dusted off the boxes of ornaments, all carefully pack away in tissue paper since last year. What a treasure these ornaments are! An ornament for each memory in the treasure chest that makes up our lives. Long ago, at some point in my childhood which has since been forgotten, I made a collection of cinnamon gingerbread ornaments. My mother still has these ornaments and they decorate her tree to this day. And they smell just as sweet and spicy as the day I made them. I decided this year have my children make a collection of their own. Homemade treasures to add to the chest are the most precious. 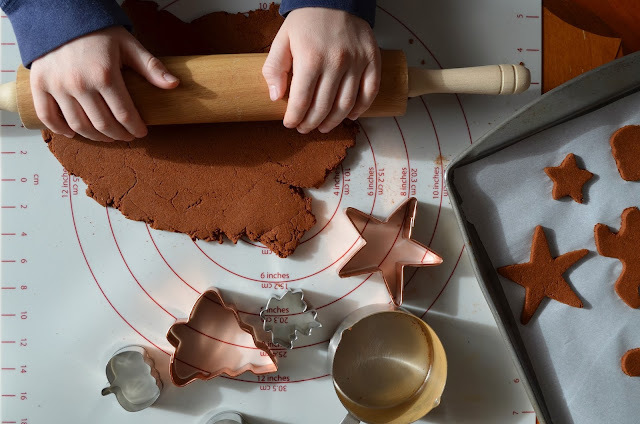 I've been scouring Pinterest and the Internet trying to find the classic recipe for cinnamon gingerbread ornaments. The one that I possibly used as a child. I decided on a recipe from Martha Stewart. I don't know if it's the vintage recipe, but they turned out just as I remember. Warm and rustic. I hope they last as long as the ones on my mother's tree. Check back in 30 years and I'll let you know. But for now they're just perfect. 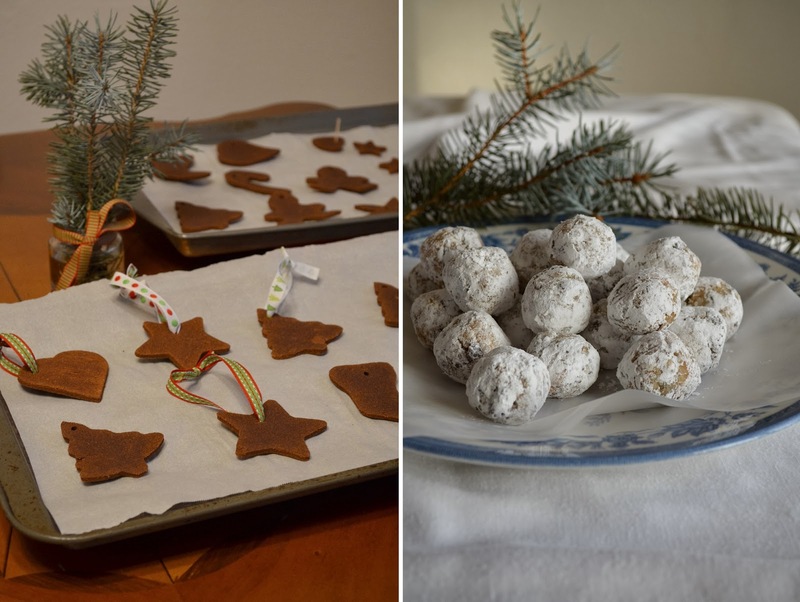 Of course with these ornaments baking for two hours, filling the house with the most enticing aromas of cinnamon and apple, I knew I had to make something edible to quell my craving for sweets. With the oven being occupied, I decided to whip up some rum balls at my husbands request. They're something he remembers from his childhood, though in Kentucky his aunt made them with Maker's Mark instead. I made these with basic Nilla wafers (they're always in my pantry), honey, spiced rum, and chopped raisins. Easy as can be! 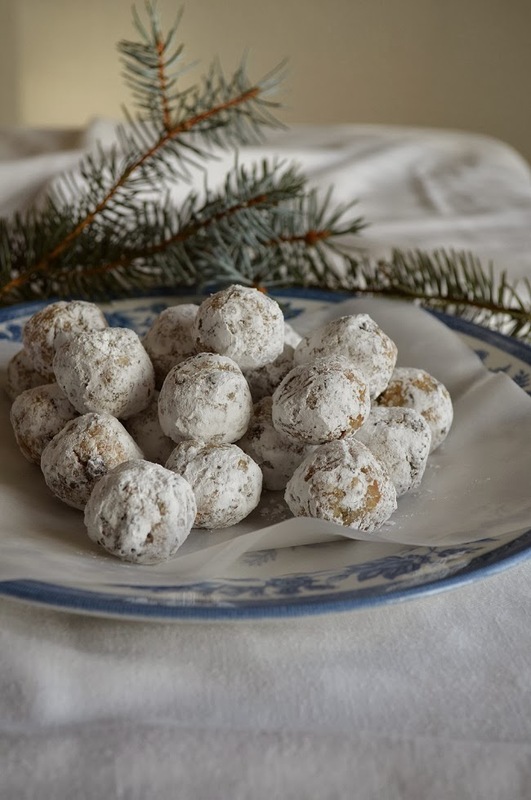 Just mix it all together, from into truffle-like balls, and roll in icing sugar. They can be eaten right away, but the flavor matures and mellows as they sit. It was getting dark (so early these days!) as the kids were hanging the last precious memories on the tree and I was gathering up remnants of tissue paper and stray pine needles, when Bing Crosby's rendition of Deck the Halls came belting through the speakers. No one can sing it like he can! So nostalgic yet so modern. And I closed my eyes for just a moment and imagined that I was a child once again. Then I remembered the rum balls in the fridge and was very happy to be all grown up. I think I've found the holiday cheer after all. Process the cookies in a food processor until the crumbs are fine. Place in a bowl. Chop the raisins and add them to the bowl. Stir in the remaining ingredients and mix until a dough-like consistency forms. It will seem very dry at first, but keep mixing and it will come together. If the dough still seems too dry after mixing for a while add just a splash more rum. You're looking for a dough that's moist, but not too sticky. Scoop out heaping teaspoons of dough and roll them into a balls. 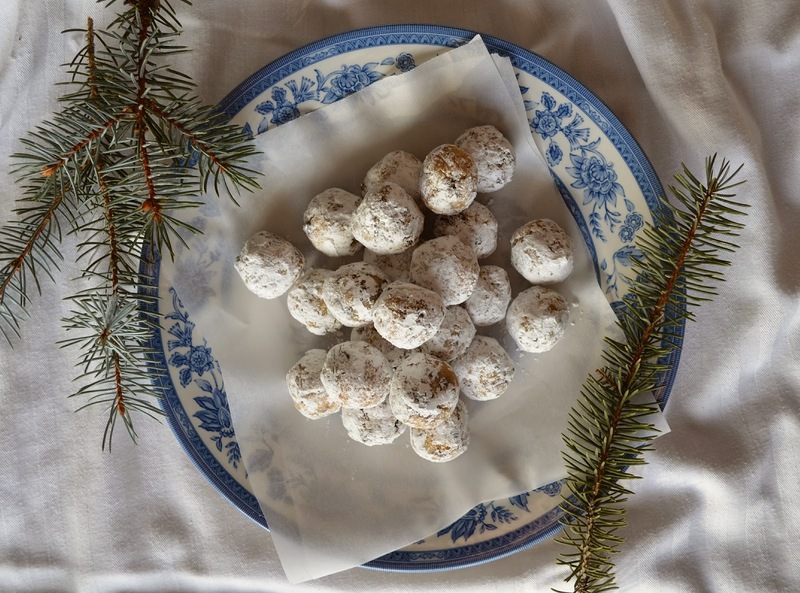 Roll the balls in more icing sugar. Refrigerate until firm. These can be eaten immediately, but they get better the longer the sit. Store in an airtight container in the refrigerator. In a large bowl mix the apple sauce and cinnamon until evenly moist and crumbly. Stir in the school glue and mix well. Knead the mixture until it comes together in a ball. Wrap the dough in plastic wrap and let set for 30 minutes. Meanwhile, preheat your oven to 200 F (90 C) and line two baking sheets with parchment paper. Bake the ornaments for 2 hours, turning them over half way through the cooking. Allow to cool, then thread a pretty ribbon through the hole and hang on the tree.